Discussion in 'Online Games - News and Reviews' started by Marina, Sep 30, 2013.
animated sitcom and humorous and sometimes satirical content, the popular series is an all time classic. A featured film was even made. With the popularity of South Park, Net Entertainment has now made it available as an Online Video Slot that you can play for real money. which were created from some of the classic episodes featuring Kenny, Kyle, Cartman and Stan. There are three different mini features that will happen randomly while playing and will help you increase your winnings. 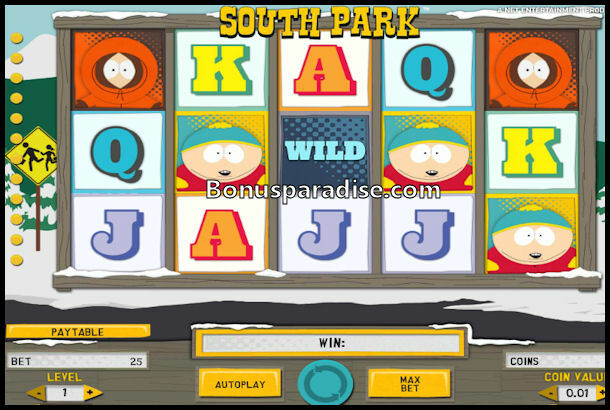 South Park is a 25 payline online video slot. It features an auto play and max bet option. Players have the option to increase the level of their bet per spin. All wins pay left to right. Winning symbols include Cartman, Kenny, Kyle, Stan. There is a Wild symbol and Bonus symbol along with special Bonus symbols that have Cartman, Kenny, Kyle and Stan on them. The Wild symbol can appear anywhere on the reels in the main game and substitutes for all symbols except the Bonus symbol. It also appears in the Kyle Bonus round as Ike and is sticky in the Stan Bonus round. There are four different Bonus Rounds. To activate this feature, you must receive 2 Bonus symbols on reels 2 and 4 and then one of the character Bonus symbols on reel five. You can land a Catman Bonus symbol, Kenny Bonus symbol, Kyle Bonus symbol or a Stan Bonus symbol. Each have a specific play. The Kyle Bonus round earns you 10 free spins. There is a special Ike Wild symbol that will activate a mini bonus. When Ike appears on reel 5, you can win an additional 3 free spins, win multipliers of 2x to 10x on that spin or a cash prize. the danger zone has traps and the multiplier zone where you can increase your winnings. Stay away from the traps which causes accidents and you lose a life. The Cartman Bonus round has eight bushes for you to pick from.You have one choice, but may pick a bush to try again. You could chose coin wins, double up, reset, warning symbol or game over.Chose carefully. The Stan Bonus round has you going for spins. A sticky Wild symbol appears on reel 3 and stays there for 2 additional spins. As long as a sticky Wild symbol appears anywhere on the reels, the spins continue. Terrence and Phillip mini feature will randomly happen during regular game play. Two figures will appear and hop onto reels 2, 3 or 4 making 3 landing spots Wild. This could really earn you some winnings. Mr. Hankey mini feature will also be random during regular game play. reels 1, 3 and 5. Imagine getting 2 additional Wild symbols? Cartman mini feature is also random during regular game play. It is a 3x3 square of Wild symbols and it's called Beefcake Wild. Imagine having a block of nine wilds? Wow! Nothing lacking in South Park video slot. Bonus rounds galore and the mini features sure make this a hit. I absolutely love the new South park Slot! It has So many Bonus rounds!!! What a great slot game!! I like the mini features. Imagine getting all those wild symbols? I really love the South Park Slot. He can pay very well with the BIG Wild in the middle. I am just not one of them, and Mike also not - so far.